Happy Monday, Friends. Let’s start off the week with another free to use pattern, shall we? 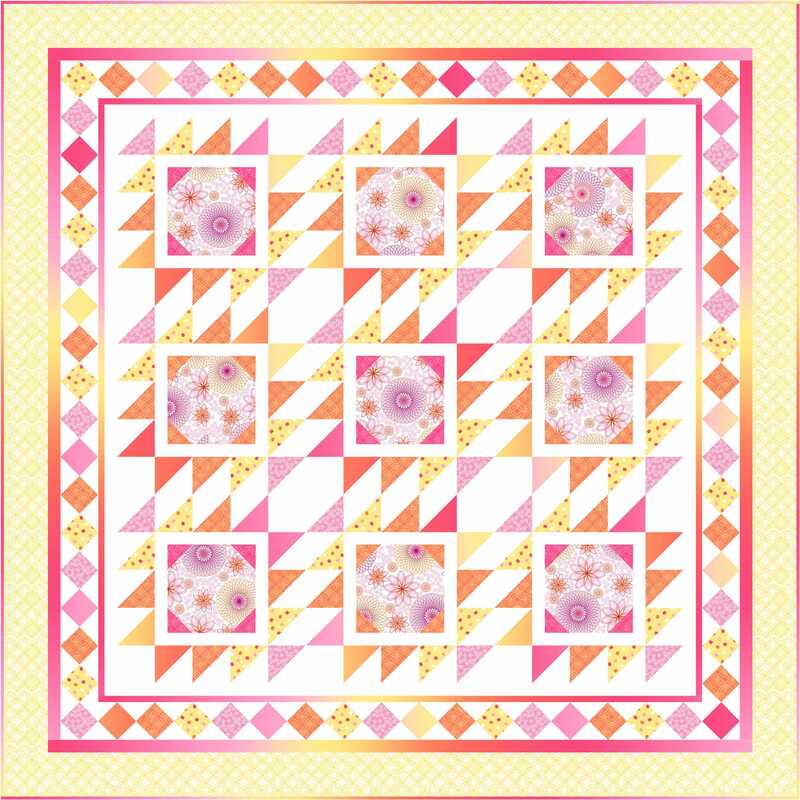 The quilt shown in the following is designed with Quilting Treasures’ Hot Topic fabrics. Click here to view the entire fabric range. You simply have to check out these fabrics. I won’t spoil it for you, but I am going to say I used to love doodling with Spirograh templates! And the ombre fabric is just too cool! And I am thinking summer and orange crush and azaleas when I see the fabrics. Click here to download the pattern instructions in pdf. Thanks for stopping by. Have a lovely day and week. I love this, Wendy! Both the color and the design. That is a nice pattern. Thanks for sharing it with us. It says spring to me!!! Such a cheerful way to begin my day on this snowy morning. Fun pattern, cute fabrics, although I may have to do something else instead of the orange. Love the pinks and yellows!!!! I love that pattern Wendy – perfect for a focus fabric :*) Thanks for sharing it with us! Hi wendy! Love the pattern and colors! they are perfect for each other. “summer and orange crush and azaleas”…..at the moment, only a dream. Stay safe, dear friend. Love the pattern and the fabric!!!!!!!! Thanks for the pattern. I LOVE it, and I too loved Spirograph. Wish I still had it….Love the fabric, this may be a fabric I Have to have. Happy Mardi Gras!